Given up as lost for generations, footage from World War I never before seen by modern audiences comes to thrilling new life in BEYOND ZERO: 1914-1918. 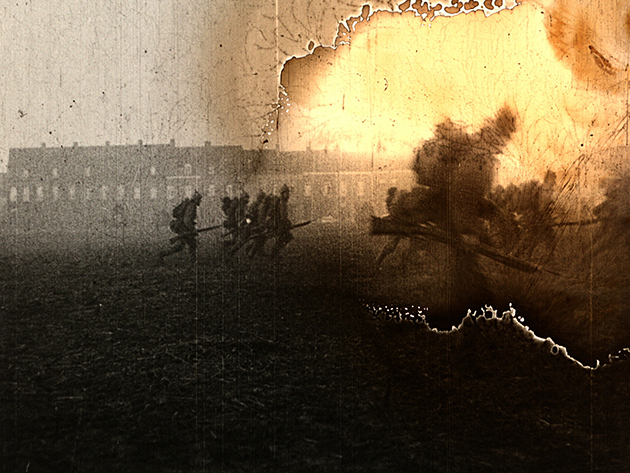 Auteur director Bill Morrison scoured film archives for rare 35mm nitrate footage shot during the Great War. 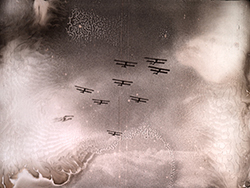 Now, viewers can see an actual glimpse of a war fought in fields, in trenches, and in the air emerges for the first time. Through a veil of physical degradation, unstable chemical elements and the bleeding of original film dye, viewers can see soldiers performing training exercises, parades and troop movements. While some of the battle footage was re-enacted for cameras, some is documentary footage of the war itself. All the footage was originally shot on film at the time of the conflict. A prismatic and cinematic a message in a bottle from a century ago and accompanied by a magnificent score by Aleksandra Vrebalov performed by the Kronos Quartet, BEYOND ZERO: 1914-1918 is a powerful record of wartime past. Out on the same fields with the soldiers 100 years ago, the film is itself both collaborator and survivor.